The only legal unit measurement of firewood is the CORD. measuring 4 ft. wide x 4 ft. high x 8 ft. long." The total volume of a CORD is equal to 128 cubic feet. There is no legal standard for the "Face Cord"
but it should be @ 45 cubic feet = 1/3 cord. Beware of sellers offering "Face Cord" or (4 x 8) quantities !! "Face Cords" should be multiplied (x3) to determine true full cord pricing !! An average seasoned cord of hardwood weighs more than 2 tons!! Unstacked it will take up to 200 cubic feet in space. An 8 ft. pick up truck would have to pile the wood uniformly at 5 feet tall to fit an ustacked cord. The average pick up truck can only haul 1/2 a cord of firewood at a time. When wood is fresh cut it contains a lot of water. By properly splitting, stacking and storing wood the will become seasoned once the water is evaporated by the sun and wind. When the wood reaches a moisture content (MC) of less than 30% it will burn properly and release the optimum stored BTU's (heat). Wood with more than a 30% MC should not be burned indoors!! It is very inefficient and produces dangerous acid water vapor (Creosote) in your chimney. 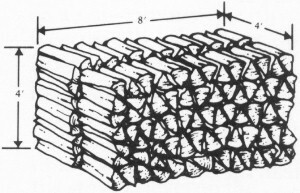 The technique of drying wood in modified lumber kilns produces consistenly high quality firewood with a moisture content (MC) of 25% or less. Kiln drying is widely used to allow food stores and restaurants to carry firewood products that meet USDA standards that include bug & larvae free products. Due to the superior quality and BTU production KILN DRIED Firewood has become very popular with residential customers. There are many characteristics to consider when producing and burning firewood. The wood should be plentiful and renewable. The wood should be easy to split. The dried weight of the wood should be considered. The ease of burning and throwing of sparks is also important. Perhaps the most important is the BTU's (heat) and aroma of the firewood. Since each species is different, be sure you know which type of wood is best for you. On Long Island we burn mostly Oak and Maple. Upper New York State uses less Oak and concentrates more on Maple, Ash, Hickory and Birch. Today's wood stoves are very economical and produce much more heat than a fireplace. A fireplace uses warm air from the room to feed the fire while drawing cold outside air through cracks and drafts to replace the air in the room. The large size and masonry construction of a fireplace also does not maximize heat exchange. Firewood in fireplaces tends to burn much faster while producing less heat. Modern wood stoves are generally 50% or more efficient than fireplaces, but you may lose the ambiance that only a fireplace can produce. Fireplace inserts are a great way to improve the efficiency of a fireplace. Firewood needs the sun and wind to remain optimal for burning. Firewood should not be completely covered unless long periods of heavy rain or snow are forecast. Always store firewood off the ground in an area that receives both sun and prevailing winds. A thin tarp or pieces of plywood can be placed on top to repel rain and moisture, but always leave the sides open and the entire wood pile open whenever possible. Trapped moisture can only create mold,fungus,bug and decaying problems. Remember wood retains the heat of the day and moisture will build underneath a cover when the outside night air becomes colder. Storage of dry firewood in an open wood shed, under a porch roof, in a garage or on a log rack or ring is optimal. Many far northern climates use pine successfully as firewood. Although the wood has a much lower BTU rating than quality hardwoods, pine and other similar species are burned in some Northern climates for home heating. The use of pine and softwoods can be debated, but the fact remains that it is used. The benefits include: it is widely available & very sustainable, it seasons faster than hardwoods, it is easy to split, starts easy, is lighter than hardwoods and has a pleasant aroma. The drawbacks include: Creosote buildup in the chimney, low BTU's, frequent bugs, exploding sap pockets and it is very fast burning. "- All trees or logs that are processed into firewood that is declared to be from the named source shall have been grown within 50 miles of the named source, prior to being obtained by the firewood producer."